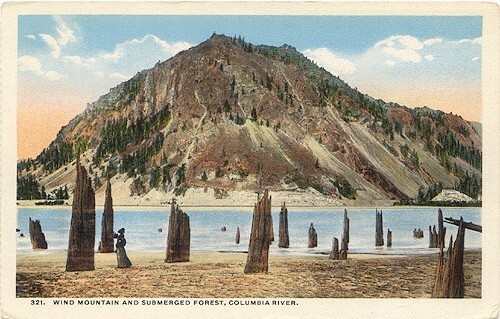 Lewis and Clark camped on the Washington side of the Columbia, upstream of the Little White Salmon River, at a village near a "Pond". 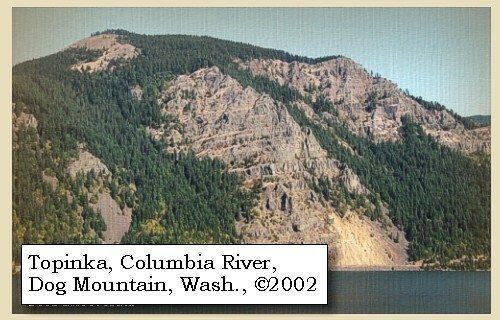 Today the Washington town of Cook is located at the mouth of the Little White Salmon River. 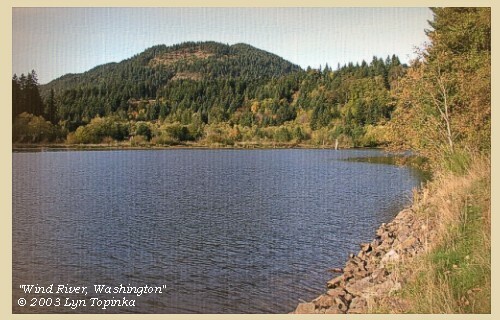 2002, Dog Mountain, Washington, as seen from Starvation Creek State Park, Oregon. (Click to enlarge). Copyright © 2002 Lyn Topinka, private archives, used with permission. On the left side four different streams of water empty themselves in cascades from the hills. 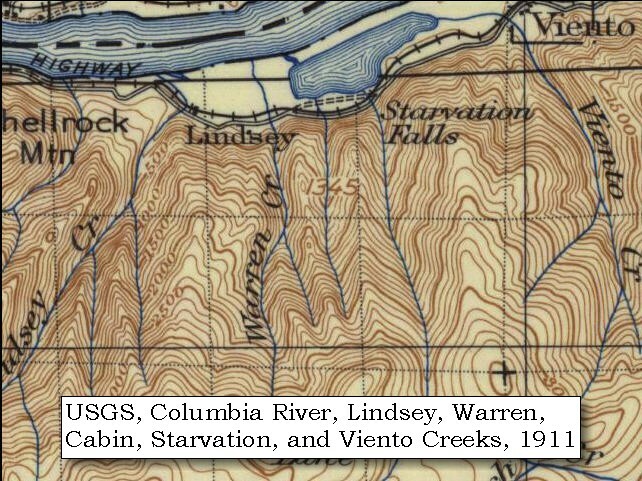 The possiblities in this area are Starvation Creek and Falls, the seasonal Cabin Creek and Falls, Warren Creek and Falls, and Wonder Creek and Lancaster Falls. Lindsey Creek and Falls is another one half mile further west. 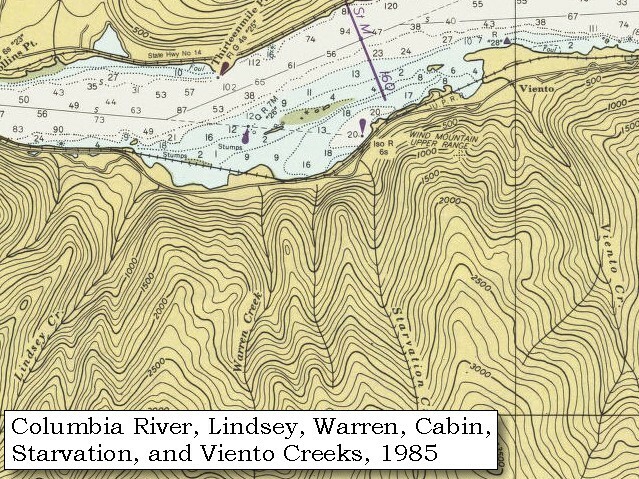 The possiblities in this area are (upstream to downstream) Starvation Creek and Falls, the seasonal Cabin Creek and Falls (depicted but unnamed on these maps), Warren Creek and Falls, and Wonder Creek and Lancaster Falls (not depicted on these maps). Lindsey Creek and Falls is another one half mile further west, and Viento Creek is upstream. 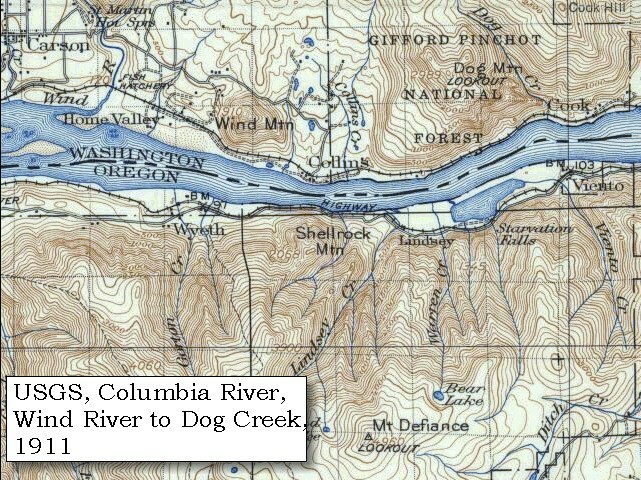 1999, Map, Mount Adams and Vicinity, showing drainages into the Columbia River. (Click to enlarge). Includes the Wind River, Little White Salmon River, White Salmon River, and Klickitat River in Washington State, and the Hood River in Oregon. 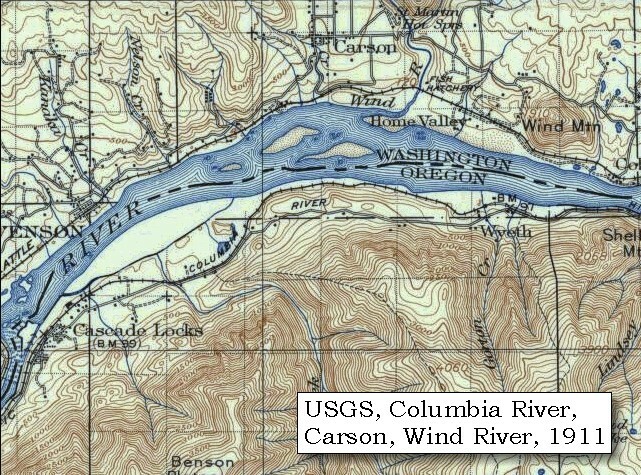 Map modified from Vallance, 1999, USGS Bulletin 2161. 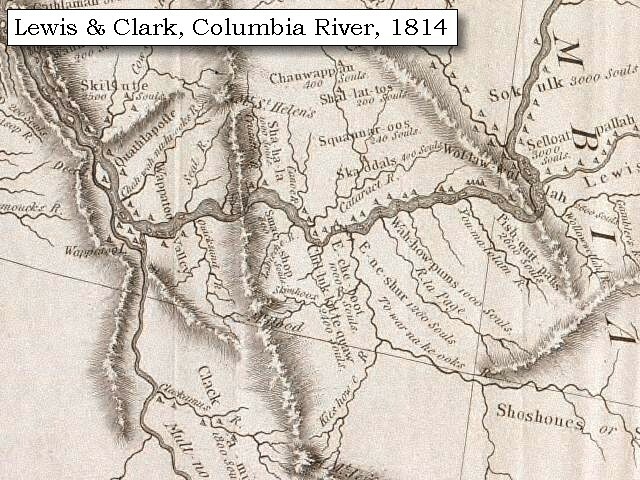 1814 Map, Lewis and Clark (section of original). (Click to enlarge.) Shows the Wind River ("Crusatte R."). From the "Nicholas Biddle/Paul Allen" 1814 publication. Original Map: "A Map of Lewis and Clark's Track, Across the Western Portion of North America, From the Mississippi to the Pacific Ocean". From: History of the expedition under the command of Captains Lewis and Clark : to the sources of the Missouri, thence across the Rocky Mountains and down the river Columbia to the Pacific Ocean : performed during the years 1804-5-6 : by order of the government of the United States / prepared for the press by Paul Allen. Philadelphia : Bradford and Insskeep, 1814. Harold B. Lee Library, Brigham Young University #upbover maps37. -- Brigham Young University, Harold B. Lee Library Website, 2004. 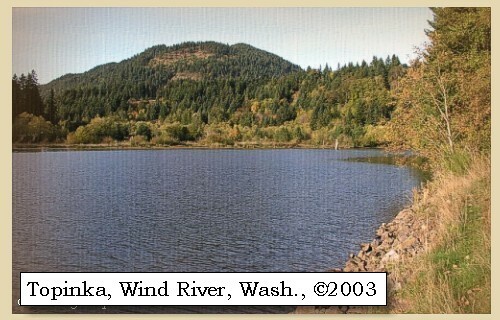 2003, Wind River looking upstream from near mouth. (Click to enlarge). Copyright © 2003 Lyn Topinka, private archives, used with permission. Just below this creek [Rock Creek] we passed along the right side of three small islands on the right bank of the river, with a larger island on the opposite side, and landed on an island [???] 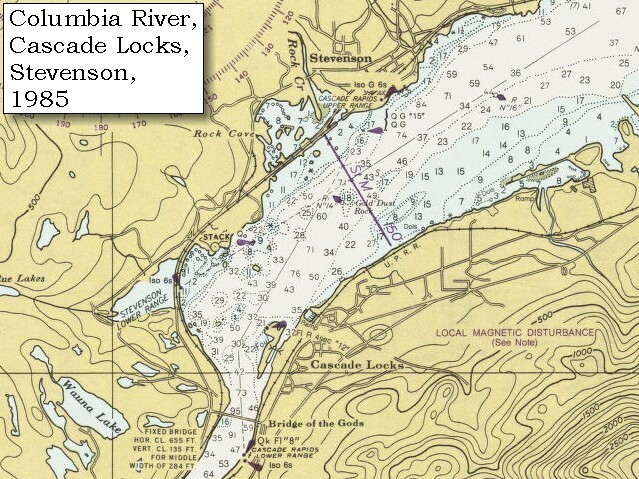 very near the right shore at the head of the great shoot [The Cascade Rapids, today the location of the Cascade Locks], and opposite two smaller islands at the fall or shoot itself. 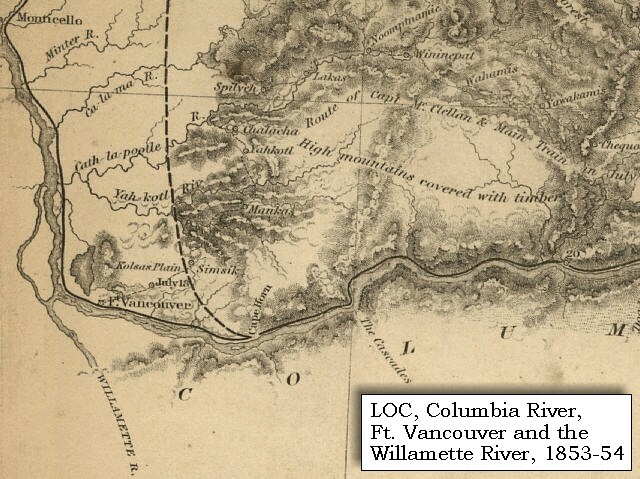 Lewis and Clark have arrived at "The Lower Falls of the Columbia", an area also known as the Cascade Rapids, and today the vicinity of Cascade Locks, Oregon. 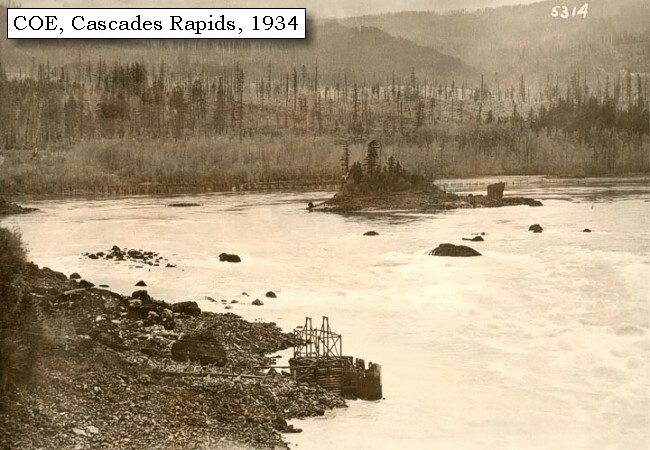 In 1896 the Federal Government built a series of locks around the trecherous rapids. 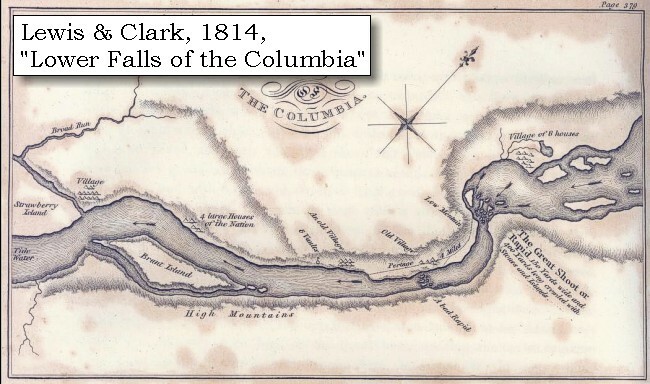 Lewis and Clark called the area around today's Cascades Locks "the Lower Falls of the Columbia" -- the Celilo Falls area was known as the "Great Falls of the Columbia". Throughout time, the area became known as the "Cascades", and in 1825, John Work of the Hudson's Bay Company was the first to record the place name, "Cascades," to describe these falls in the Columbia. 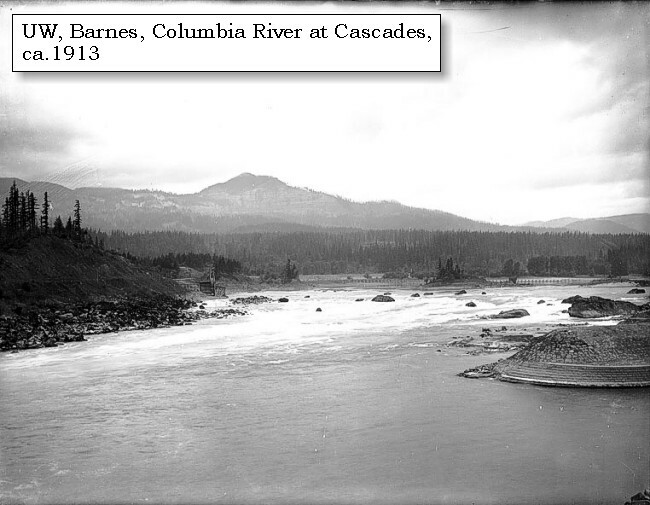 Four and a half miles long, the Cascades of the Columbia were separated into two sections. 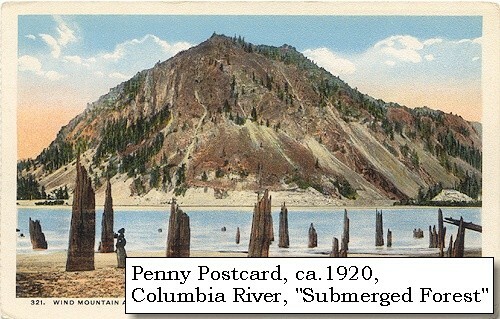 The first made a bend around a rocky point on the Oregon shore, then went into a 2,000-foot-long pitch in the river and a 21-foot drop. This was called the Upper Cascade. 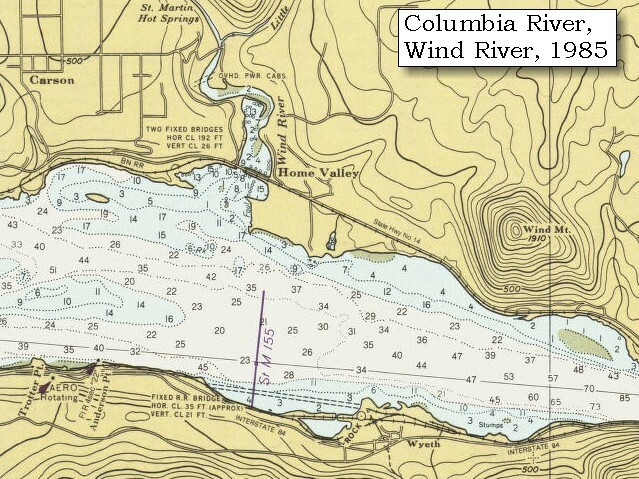 The rest of the contracted waterway, the Lower Cascade, was a long three-and-a-half-mile pitch in the river. 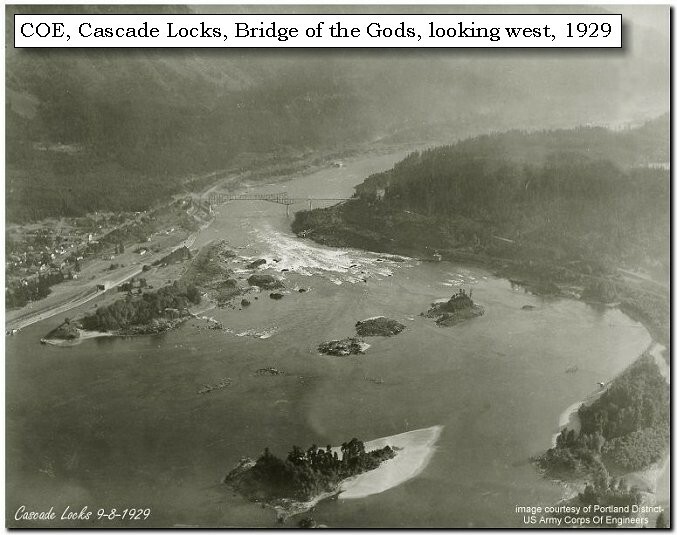 The total fall of the river from the head of Upper Cascade to the bottom of Lower Cascade was 45 feet at high water and 36 feet at low water. 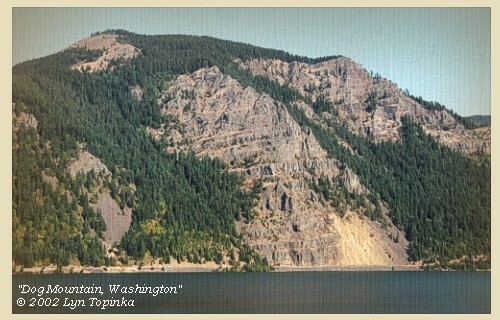 Lewis and Clark first portaged around the "Lower Falls of the Columbia" in 1805, on their journey to the Pacific. Forty years later the pioneers traveling the water route on the Oregon Trail made the same portage. 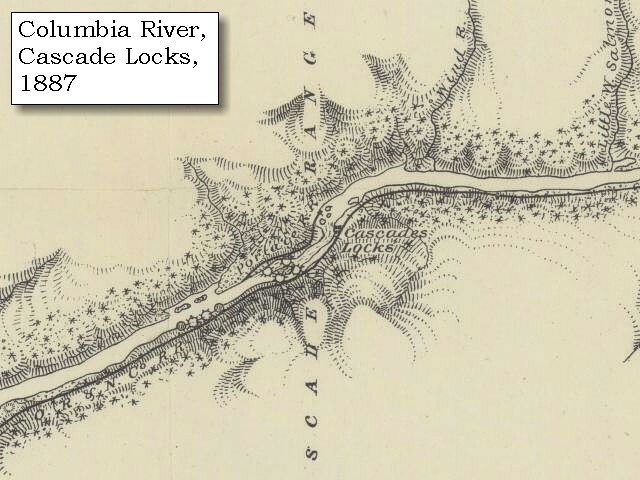 In 1850 a road was built on the north side of the Columbia to portage around the rapids, and a small settlement developed to help travelers around the rapids, first by foot and then by mule-drawn rail cars. In 1864, the first steam engine in the Northwest carried passengers and freight past the rapids. 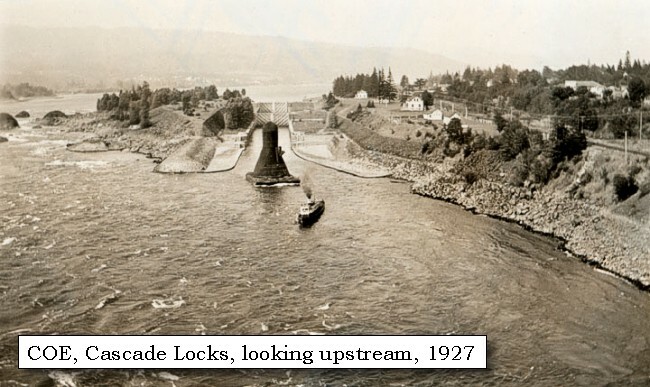 In 1896 a 3,000-foot-long navigational canal with locks was completed and the modern-day town of Cascade Locks developed. 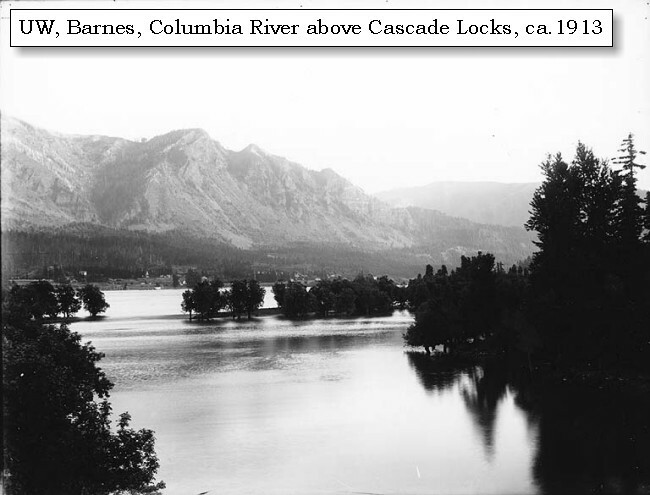 The Cascades and the early locks were flooded by backwater from Bonneville Dam in 1937. 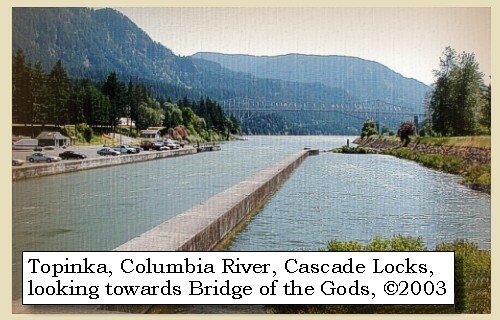 -- "www.cascadelocks.net" Website, 2004, and Washington State Historical Society Website, 2004, "Lasting Legacy". 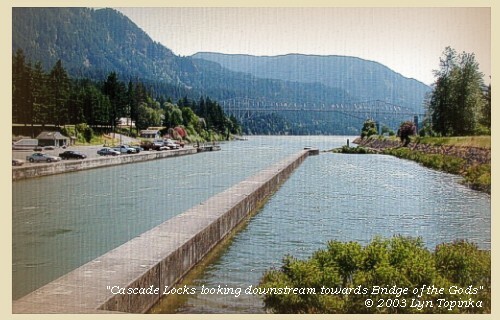 2003, Cascade Locks looking downstream towards Bridge of the Gods. (Click to enlarge). Copyright © 2003 Lyn Topinka, private archives, used with permission. Just above the island on which we were encamped [today this island is underwater] is a small village of eight large houses in a bend on the right, where the country, from having been very mountainous, becomes low for a short distance. We had made fifteen miles to-day, during all which time we were kept constantly wet with the rain. ...... As soon as we landed, captain Lewis went with five men to the village, which is situated near the river, with ponds in the low grounds behind: the greater part of the inhabitants were absent collecting roots down the river: the few, however, who were at home, treated him very kindly, and gave him berries, nuts, and fish; and in the house were a gun and several articles which must have been procured from the whites; but not being able to procure any information, he returned to the island. 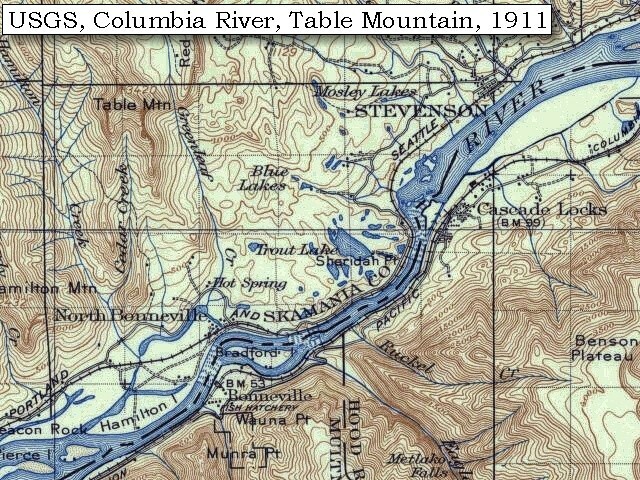 Captain Clarke had in the meantime gone down to examine the shoot [The Lower Falls of the Columbia], and to discover the best route for a portage. He followed an Indian path, which, at the distance of a mile, led to a village on an elevated situation ...... After going about three miles the night obliged him to return to camp: he resumed his search in the morning. 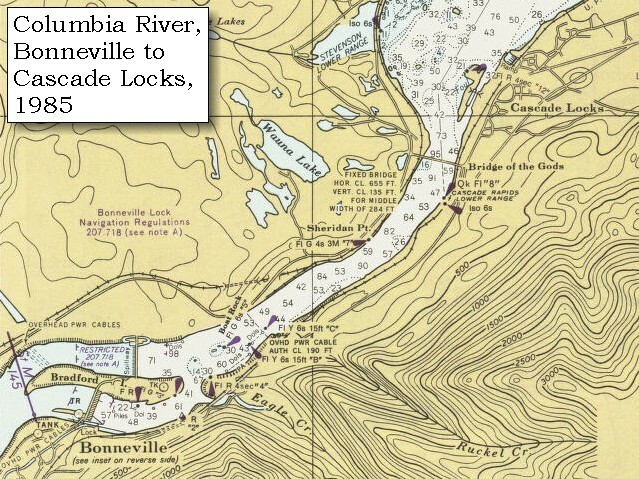 Lewis and Clark's camp of October 30 and 31, 1805, was on an island on the Washington side of the Columbia River, above the Cascade Locks just north of today's Bridge of the Gods. This island is now under water. On the return trip home, Lewis and Clark stayed just south of here on April 12, 1806.